Not sure in what category to put this question, but since it seems to be partially UPLC-related, due to the shift in retention time, I guess here is as good as any. 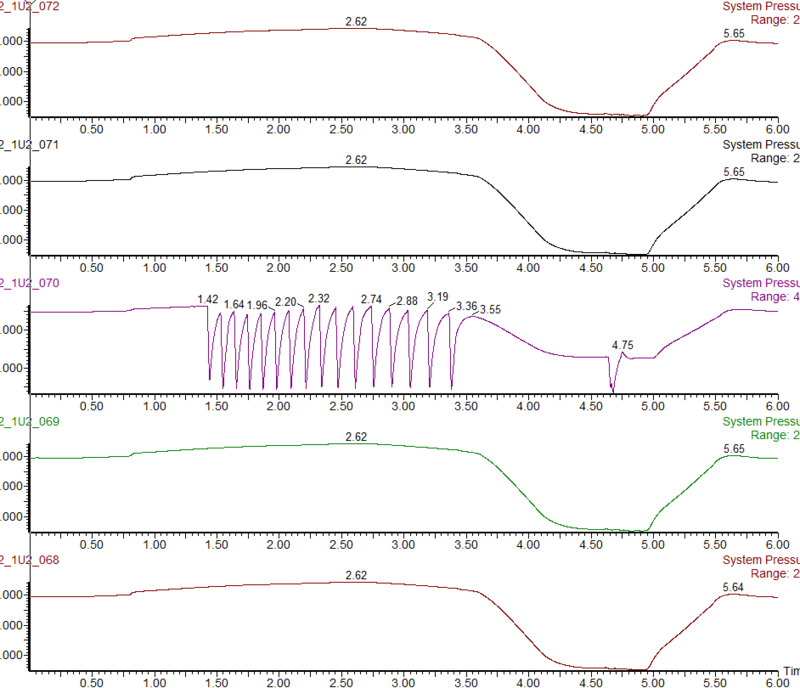 I am doing a drug screen on urine samples, and I have added the chromatograms for three of the internal standards in the assay for three different runs in a row: run 033, 034, and 035. As you can see in the figures, the retention time for d5-Oxazepam matches for the three runs, but for run 034 both d3-Amphetamine and d3-Cocaine is coming off the column too early. Has anyone seen this problem before and knows what could be causing it? Seems compound specific. I'm guessing it could be the pH of the sample extract. Rerunning the sample now and will see if problem persists. Change system, change column and see if the problem persists. Figured out the problem. 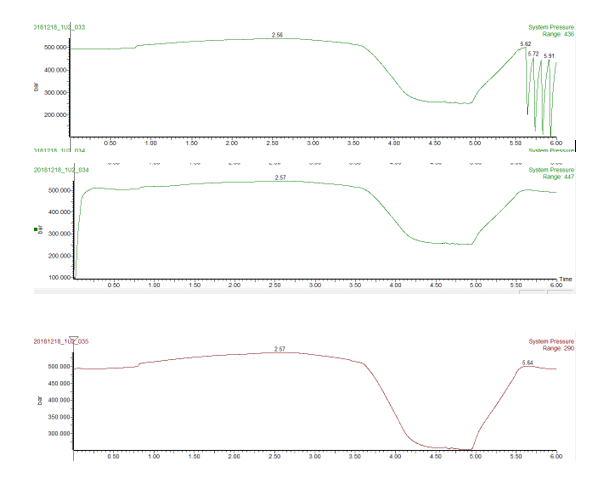 Looked at the pressure profiles for these three runs and at the end of run 33, the backpressure is all over the place. This causes the next run to start at a much lower backpressure than it should, causing the earlier eluting compounds to shift in retention time, while the later eluting ones seem to be OK.
Why this happened, though, I do not know. Could be, but I just had this happen again. And you can see the pressure is dropping and gaining from minute 1.42 to minute 3.55. Quite a long time and that would have to be a few bubbles. I'm suspecting something else.